Originally based in Makati, the clinic/aesthetics school has actually been around but it's something of a well-kept secret in the community. The Filipino co-owner and Hallyu Secret President, Ms. Kris tells me that their client base are primarily those who train with them and later on open their own skin clinics but more locals are finding out about their services as well because of the growing interest in K-beauty. This month, the clinic moved to its current location in Connecticut, Greenhills, San Juan. According to Google, Hallyu means "Korean wave," or "Korean fever," it refers to the sudden increase in popularity of South Korean culture around the world in the last decades. Indeed, nobody can deny the influences made by Korean’s hallyu everywhere. Name it, from Korean restaurants, music, videos, pop culture, fashion, languages and now even aesthetic beauty treatments—made the Korean way. 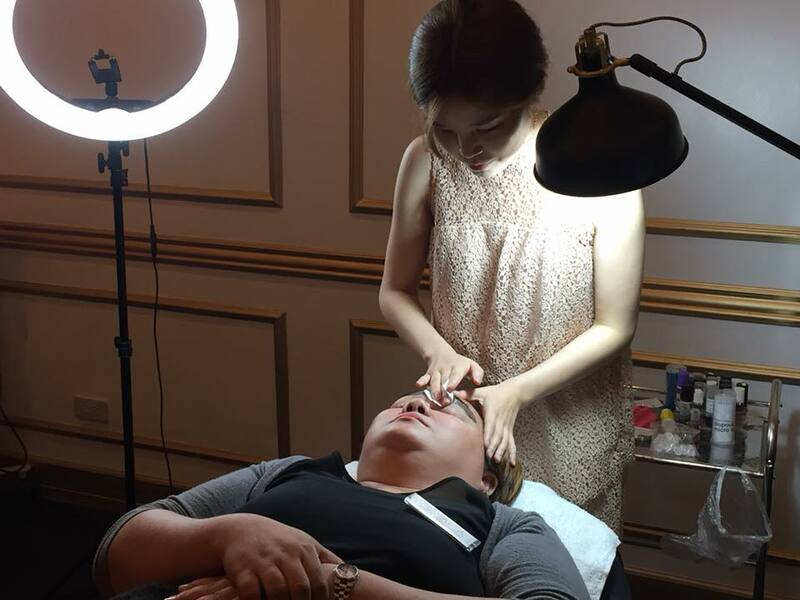 When it comes to spas and facials, Ms. Kris also explained that Koreans opt for maintenance over indulgence. They like to frequent their friendly neighborhood skin shops, which they call as “skin maintenance shops.” (피부관리실). “They like to make sure that their skin is relaxed, this assures them better looking and supple skin. Regular maintenance is a must for them,” added Ms. Kris. A client is being brief thoroughly on whatever procedure she will be availing prior to the process. Purple Plum Fairy says she's not comfortable wearing a tube towel, but she does this for her to experience how Korean facials really are done. So you show up, take off your shoes and shirt, and lie down on a cushy table. If you’re wearing heavy eye makeup or mascara, the aesthetician may place cotton pads soaked in makeup remover on your eyelids while working the rest of face with cleansing cream. I only wore a lipstick but that too has to be removed. After freshening up with a toner, it’s time to do a facial massage. 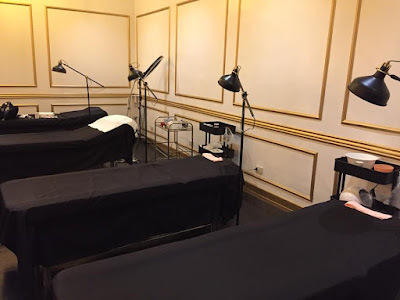 Depending on the season and skin condition, the massage is preceded by a few minutes of pricking (if you have acne), and since Ms. Kris thinks there's no need for me to undergo pricking (thank heavens for blessing me with good genes!). I don't need to go through all that tedious pricking process. See those foams on my face? They're very relaxing! What do I love exactly about this Korean facial? First of all, Hallyu Secret used gentle cream-based enzyme that's great for sensitive skin like mine. I love that the products they used on my face didn't leave an uncomfortable feeling on my skin unlike the other facial treatments I've had before which leaves my skin with either itchy or stinging pain after feel. Yes, walang mahapdi sa mukha. Just a relaxing feeling all throughout the facial treatment. After a generous layer of ampoule or mositurizing essence, a top and bottom sheet mask is stretched taut over the face to seal in the moisture. While I'm masking, the maintenance continues to other parts of my body. I particularly liked the moisturizer because unlike similar products I've tried, the formula is light, watery, and doesn't leave a greasy residue. In Korea, there’s a reason you’re asked to change into a loose tube gown for a facial. Beauty experts say your face actually starts at your chest and ends at the scalp, so it shouldn’t be a surprise that one of the highlights of the facial doesn’t actually happen on the face. Using massage oil, aestheticians expertly massage the shoulders, neck and upper chest. At Hallyu Secret, this massage isn’t meant to simply moisturize an otherwise overlooked area—it’s also designed to drain the lymph system and promote circulation. It’s invigorating and relaxing at the same time. Lifting massages are meant to help defy gravity and aging. The aesthetician massages aloe directly onto the face using pressure. This is a lighter form of kyeong-rak massage, a high-pressure traditional massage targeting energy flow points. These days, kyeong-rak massages are sought out more for shaping or reducing the size of the face, especially the jawline, to achieve that highly-coveted “v-line.” Results are anecdotal, but some people swear by them. I was politely asked by Ms. Kris if I wanted to get rid of my double chins through the help of injections. I would've wanted to if I had not been diabetic. But I opted for RF (radio frequency) treatment instead. After a quick wipe off, my aesthetician showed me the flat, wide metal scrubber tip that would be used to deep-cleanse my pores. It looks a little intimidating but actually feels really pleasant! From what I understand, it uses water and ultrasonic technology to gently exfoliate your skin. Depending on how clogged my pores are, they sometimes get a little help from an ultrasonic skin scrubber. The aesthetician would stop every so often to wipe off the dead skin layers from the metal tip but I didn't experience any redness or irritation. A special gel was applied to my face and the attendant switched to a round head attachment for the ultrasonic part of the treatment. It's supposed to open my pores and "soften" any trapped gunk. If you've ever had an ultrasound procedure, this is pretty much the same experience except it's on your face and feels a bit warm. The warmth felt comfortable and even soothing to me but if it gets to be too much for you, don't hesitate to let your attendant know. If you're claustrophobic, the PDT isn't for you. PDT treatment is said to help delay early signs of aging. This is because the said treatment is designed to seal over the entire face, leave for the nostrils (cotton pads cover and protect the eyelids). It’s elective, but lips are also a part of the face and they’ll feel noticeably moisturized afterwards if you opt in. 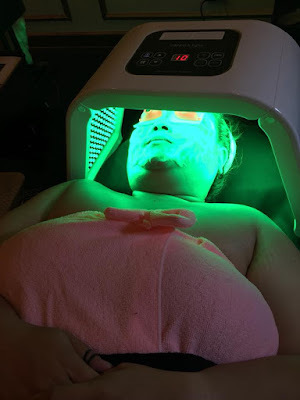 The PDT machine takes about 10 to 15 minutes of green light, and usually, sleep. Now comes my favorite part: a 15-minute de-stressing massage for the face, shoulders, and back. Other spas or clinics all have their own massage techniques that focus on acupressure and lympathic drainage. For Koreans, I guess the focus is a little different because it felt a bit like the attendant was trying to reshape my face! My cheeks were being pulled in and up, and the attendant seemed to particularly focus on working on my chin and jaw. Now that you’ve had the works, there’s just one last step: sunscreen. It’s optional, of course, but not in the Korean mind. Why moisturize religiously if you don’t plan to block out the ultimate blasphemy? My facial ends with SPF unless it’s pitch dark out. My session concludes with an assisted stretch and a little shoulder and scalp massage, mostly to wake me up because I’ve almost fallen asleep for the latter half of the facial (that’s how relaxing it is). Now I'll spare you the whole, "my skin transformed! I've never seen anything like it!" spiel, because, frankly, that would be giving you BS. However, the results were undeniably better than I'd experienced in my 10-plus years of trial and error, so for someone who's been battling skin BS her entire life, Hallyu Secret was good reason enough to write about. Full disclaimer: My complexion is still far from the poreless, "glass skin" you'll see in most Korean women, but as I've tried the Hallyu Secret facial treatment, I've witnessed several positive changes in the overall health and appearance of my skin. Not only is it generally less irate (red, itchy, and blotch-emblazoned), but it also seems to retain moisture much better, as I rarely ever notice the midday flaking around my mouth now. What's more, I found that the facial is impressively (and refreshingly) fast-acting. Meaning: As soon as they started applying the products to my inflamed, post-shower skin, I can see them make a difference. And, by the time they've finished off with moisturizer, my complexion looks and feels abundantly calmer, which is really all your girl is asking for at this point. The real takeaway here is the maintenance mindset. Your skin is not going to be perfect from a once-a-year Korean facial treatment. It's better to find a treatment you can afford, and go as often as you can afford it. Consistency is key. This is what I've learned from my visit to Hallyu Secret. Purple Plum Fairy with Ms. Kris Candyd. I'm happy to report that I woke up the next day to brighter-looking skin with no redness, which I always thought was the unavoidable effect of facial treatments. The texture was more refined and I can definitely see how regular treatment would completely elevate me to the next level of skincare goals! Ms. Kris says that clients usually get this as a weekly treatment to both maintain their skin and as an alternative to a basic body massage. They even have male regulars because in Korean culture, making the effort to look good isn't just for women. 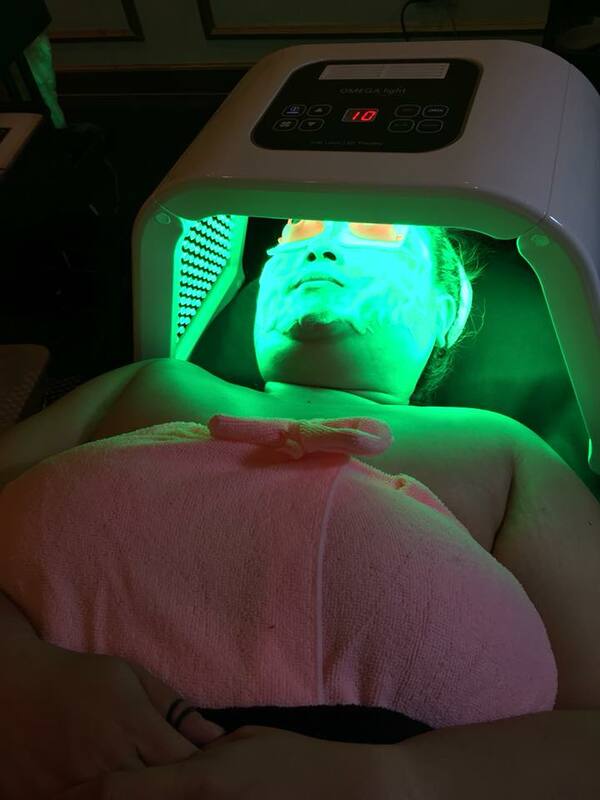 At a little more than Php1,000++ for a few minutes session, this treatment is quite pricey but I do feel that it's a good investment option if you're looking to upgrade your skincare. I enjoyed a clear, healthy glow for up to a week after my treatment, a benefit far more long-term than anything I can hope to get from applying masks and creams on my own. If it's something you can afford to splurge on even once a month, I'd say go for it. It's one of the best facials I've had in my life but the results seem to indicate that it can slowly and permanently change your skin for the better. Do you get regular facials? What do you think of this Korean version? BTW, Hallyu Secret Aesthetic & Beauty also offer other services such as Korean Eyelash Extensions, Lash lift, Korean Nail Art, Korean facial Treatments (Whitening, Anti-Acne, Anti-Aging, Gold Facial), BB Glow, Hair loss management and scalp care. They also have eyebrow microblading, eyeline pigmentation, lip pigmentation, scalp pigmentation, and hairline stranding by its Korean resident expert, LK Park. For inquiries, please call, 09087812021 or 09989570588. 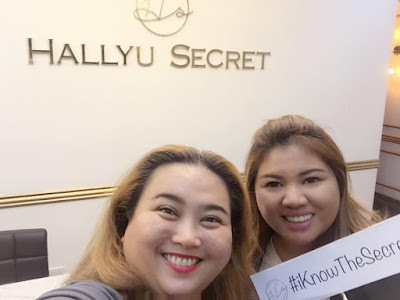 Hallyu Secret Aesthetics & Beauty Trainings and Center is located at 3rd floor, Fox Square Building, Connecticut Street, Greenhills, San Juan, Metro Manila. Special thanks to Ms. Kris Candyd and Mr. Raphael Jang. Disclaimer: I am not compensated for this post. Opinions expressed are based on my own personal experience.